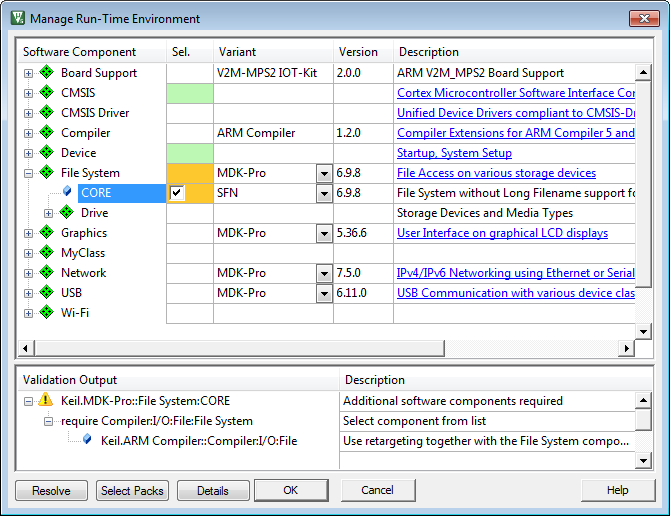 After you have selected the device, the Manage Run-Time Environment window opens and shows the related Software Components. You can select or deselect Software Components in the column Sel. at any time during the project life time. Click the Resolve button to add required Software Components to the project. This completes the set of Software Components in case of unambiguous requirements. Required components are shown in the Validation Output field. Continue with Add Source Files to Project. Managing Run-Time Environment describes the functionality. Manage Run-Time Environment describes the fields. File, Group, and Component Attributes describes the icons.